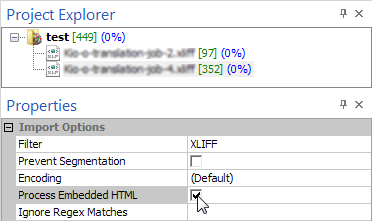 As the example illustrates, you most likely have come across a CDATA tag inside the XML file. You can find more information about what a CDATA tag is here. Essentially, what happens is that the CDATA is extracted in one go: Déjà Vu will put the whole content of a CDATA tag into one segment in the translation grid, and it won’t do anything else with it. That’s why there is HTML in the grid when you import these files, and why there are several sentences inside the segment that were not split into separate segments. Déjà Vu extracted the whole CDATA tag and dumped it into a segment. Déjà Vu has to act this way because it is required by the XML standard. The reasons for this are somewhat obscure, but nonetheless important. In the example shown above, Déjà Vu inserted several different sentences it extracted from the CDATA tag into a single segment. Given the way CDATA tags are processed by Déjà Vu, the segmentation rules are not applied to the text extracted from them. At the moment, there is no automatic way to split these segments. If you run into a CDATA tag that contains several different sentences that should be split by Déjà Vu, you can do so manually.